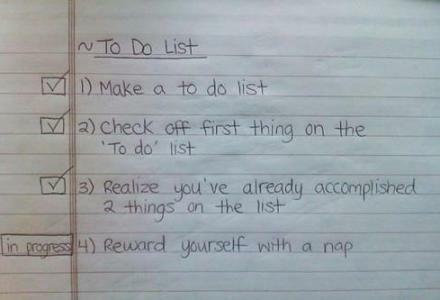 Are TO DO Lists Effective for You? Do they become a 'habit' or it doesn't 'stick'?? Discussion in 'BlackHat Lounge' started by Madruga, Jul 24, 2015. 1.) I'm curious to know how much the 'to-do lists' could help you on a daily basis, assuming you're one of the people that uses a to-do application (pc/mobile) or his own paper agenda. And what kind of things do you put in there, what are the smallest and insignificant things you put down and what are the bigger tasks? Oh, and not to forget about this question.. what happens if for some reason you don't respect that list? Will the world burn? Anyway, could it help with self-discipline as well? 2.) I had more than a few attempts to stick with a to-do program, but I always end up thinking there's no worth into imputing certain tasks and such, and somehow I forget about them. Probably my question is if you can teach 'me/us" how to effectively use it, based on some of your own experience and way of doing it. Would it be worth to put down as a reminder (task) that I need to go to a haircut next Thursday although I know I'll remember when to go? Or I should ignore that, note it down, and let my brain be less overwhelmed? 3.) What changes are being done to our behavior if we develop a habit of constantly updating and resolving the tasks from our to-do list? 5.) Any links and recommendation are welcomed, I know a few too but most of them are too complicated and with too many useless addons that makes the whole thing like specially made for busy Wall Street 'runners' who need to schedule their own fart as well. I'd prefer something more simple I think. Anyway, what to-do list software/site/or paper agenda suggestion ~ would you recommend? If any, what's your own story and experience?